Studying at NTU and having the support of the team has allowed me to develop and grow both professionally and personally and recognise that I am capable of achieving things I hadn’t dreamed of. "I chose NTU as I'm a mum of two and live in Nottinghamshire. My decision was influenced by how accessible the university was via public transport and the welcome I received during the open day. It was daunting to come back to education after such a long time but those fears were calmed as soon as I arrived at the open day. The staff were able to reassure me and encouraged me to take the plunge. "The best aspect about studying at the School of Social Sciences is definitely the staff. They are so helpful, supportive and accessible that I found myself able to reach out and get help whenever I have needed it. I have had a few highs and lows over the last three years and the team have always been there for me, both for personal and academic issues. "I had developed this idea of what the course would be like and expected to be sat for hours being talked at and understanding nothing. However, the lectures and seminars are really engaging, the lecturers are passionate about what they do and encourage questions and participation. The content of the course is different to what I was expecting, I was anticipating having to learn facts and dates and in reality, while that is a part of the course, I have learned how to think critically and develop my own ideas. I love being able to engage in the material and develop new skills at the same time. "During my first year I was a student rep, which was a great opportunity to get to know my fellow students and understand the issues faced by both students and staff. ACE Week is always packed full of interesting and fun activities – I've been to London twice, visiting the Houses of Parliament and the Natural Science Museum. There are always additional academic sessions if you should need them such as referencing (which I did need and have attended twice), using the library and online resources, and even workshops on academic writing which is so useful if you are feeling unsure of yourself. I've also been lucky enough to travel to the Netherlands to see the peer mentoring system in action at Zyud University. This was an amazing experience and one that has informed student mentoring at NTU. "In my first year I was allocated a personal tutor who has supported me throughout my degree in both personal and academic ways. This has meant my tutor knows me and is familiar with my work and style of learning, which has been so valuable. Knowing I have a member of the team I can meet with and who is there specifically for this reason is really reassuring and I have developed a great relationship with them. Aside from my personal tutor, I am very comfortable with the team, they are all extremely helpful, supportive and eager to help you achieve your potential. The atmosphere at NTU is one of support. I always feel I am able to access help whenever I need it, and that has made my experience so much easier than I had thought it would be. 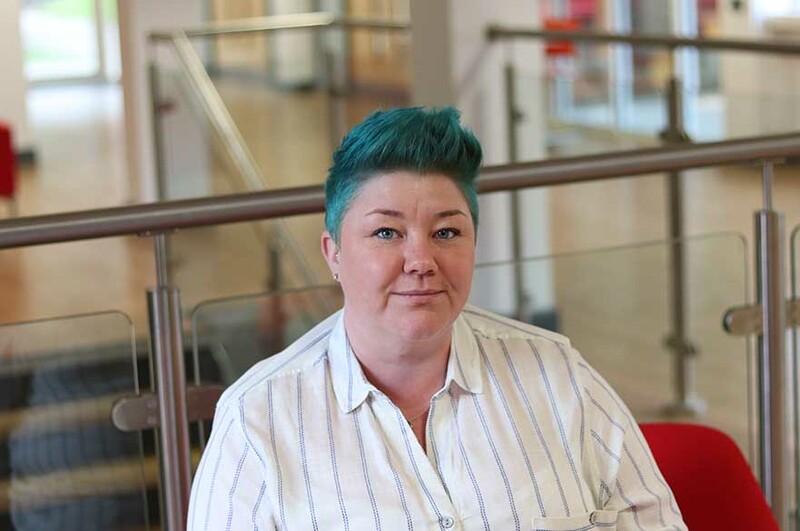 "Studying at NTU and having the support of the team has allowed me to develop and grow both professionally and personally and recognise that I am capable of achieving things I hadn’t dreamed of. This year I am embarking on another course at NTU – a Masters in Sociology. The BA (Hons) Criminology content is so varied and interlinked with other social science subjects that you get to experience many other disciplines. This resulted in me falling in love with Public Sociology during my Service Learning module and have found what I was meant to do. "My advice would be, access all of the services open to you as a NTU student, take advantage of the opportunities offered, get involved and embrace the experience. Go to your tutorials, speak to your lecturers, don’t be afraid to ask for help. Above all, enjoy it. Three years goes too fast."